This article first appeared in Enterprise, The Edge Malaysia Weekly, on June 11, 2018 - June 17, 2018. A quick Google search on “iron triangle” offers thousands of results, but topping the list is a political concept in the US that is defined as the policy-making relationship among congressional committees, the bureaucracy and interest groups. The new business landscape has redefined what an iron triangle is: now, it connects e-commerce, logistics and finance or payments. Malaysian start-up founders, also known as eFounders, are keen to adopt this “ecosystem solution” to help grow their companies and industries. This concept propelled Alibaba Group Holding Ltd from a traditional e-commerce company to a multibillion-dollar behemoth — a key takeaway that GoGet co-founder and CEO Francesca Chia got from the second eFounders Fellowship organised by Alibaba Business School and the United Nations Conference on Trade and Development (Unctad) in March. Building this triangle was not part of Alibaba’s plan, as Chia learnt during the 11-day programme, but rather a result of the company’s willingness to embrace change. “A great quote from one of our talks was, ‘Some people might say strategy in Alibaba is not planned, it was later summarised [after the fact]’. The speaker was referring to how easy it is to look back and in hindsight say it was all part of the plan. But the truth is that it was very much about embracing change to adapt and move strategically. In other words, I don’t think Jack Ma knew he would build an ecosystem in 1999. It just evolved,” she says. Chia talks about how in 2009, Alibaba’s 11.11 Global Shopping Festival crashed the e-commerce’s website and this pushed the group to fine-tune its servers so that the platform could take on the load. The following year, the same event caused the shopping cart function to go on the fritz and in 2011, the payments system broke as the existing financial infrastructure in China failed to cope. Each year, the company focused on solving the problem. “In 2012, 11.11 had record-breaking orders and purchases but the logistics system broke down. Alibaba partnered players and brought them together to create a standard for logistics. Today, they are Cainiao, Alicloud, Alipay and the marketplaces,” says Chia. Young technology companies can gain insights from this approach and attempt to apply them to their operations, she points out. She adds that SMEs will be on a good track as long as they deliver solutions to their customers and embrace any change that the solutions may bring about. She also emphasises the importance of interlinkages and the dependence on peripheral players. “We need not necessarily build our own ecosystem, but we need to listen to what Alibaba’s 18 years of experience can tell us. Apply the iron triangle. And if you are an e-commerce, logistics or payments player, think about how your other fronts are developing. The lesson I took away is how to apply a holistic approach to the solution and develop the ecosystem at home,” says Chia. To illustrate this, she says bakeries that were using GoGet to deliver cakes back in 2014 received their orders mainly via WhatsApp or Instagram and most of the payments would be cash on delivery (COD), collected by the GoGetters. “In 2018, most of my conversations with our businesses tend to be about integration with the online stores and to do all non-COD fulfilment. You can see how the developments in payments and e-commerce have impacted logistics. And vice versa, we see this as more e-commerce stores offer next-hour delivery to their customers because of our GoGetters. Timing is essential to make the ecosystem solution more seamless, according to Chia. For the same reason, venture building requires it. “GoGet would not have been able to capture our users as we did, without Waze, Google Maps, smartphones [and more affordable data plans], higher adoption of online payments, Instagram and Facebook sellers and e-commerce growth,” says Chia. 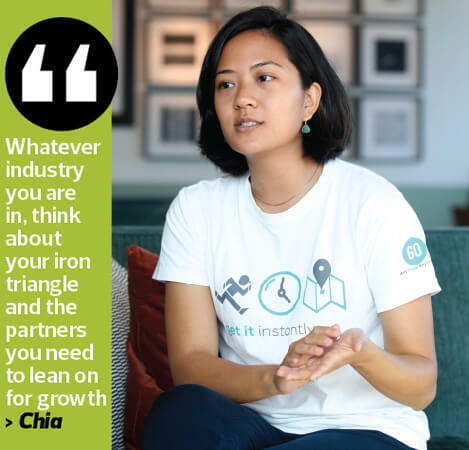 Jirnexu co-founder and chief financial officer Liew Ooi Hann presents the perspective of a finance player, saying that the iron triangle concept should be highly ingrained in how start-up founders run their businesses. He says the company sees itself as a marketplace for financial services — a key element in enabling commerce to occur. “By taking the marketplace to the digital ecosystem, we can make the same happen for e-commerce. That means enabling consumers and businesses to access credit and payment methods, protection and savings products, which are all key elements in driving the growth of e-commerce and logistics,” he adds. 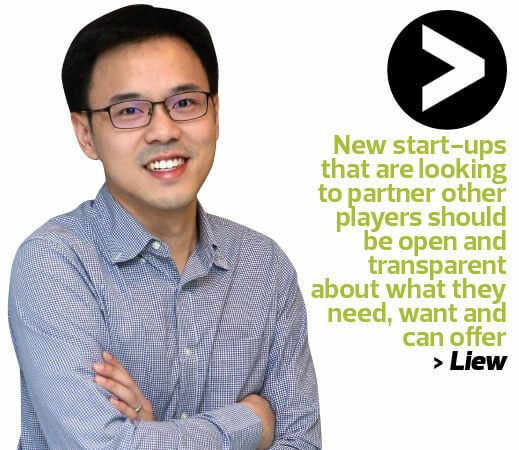 New start-ups that are looking to partner other players should be open and transparent about what they need, want and can offer, says Liew, who was one of the 11 eFounders who participated in the fellowship programme. 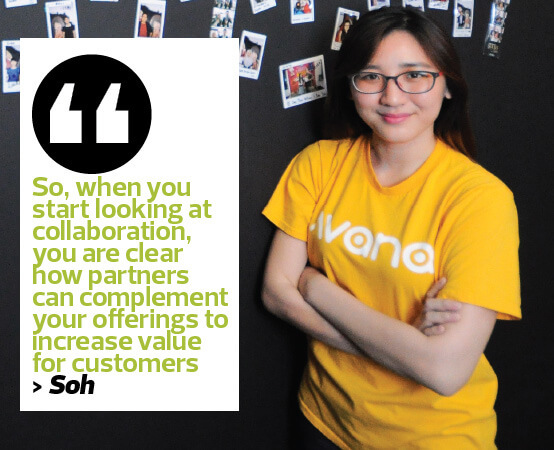 For e-commerce tech start-up Avana, the iron triangle includes all the areas it is working on to improve its sellers’ and customers’ experience, according to its chief operating officer Soh Yien Yee. She believes that the only way Avana could provide the best experience for customers is to work with logistics and payments parties while also working with policymakers to optimise its overall offering to grow the ecosystem. “Both logistics and payments command a vast scope of work, which includes managing different stakeholders, especially when it involves cross-border transactions. To ensure that the transactions are served end-to-end, every party within the iron triangle needs to provide its best service,” she says. Soh was also a participant of the eFounders fellowship programme. Avana’s focus, she says, is to help micro, small and medium enterprises (MSMEs) build scalable and sustainable businesses online through its platform, considering that this particular market is underserved and has large potential for growth. She points out that generally, MSMEs account for more than 99% of all enterprises in Asean. Avana collaborates with national postal service companies such as Pos Malaysia and Pos Indonesia for logistics and with local banks for payments. To enter into such partnerships, it is important to identify one’s unique selling proposition, says Soh. “So, when you start looking at collaboration, you are clear how partners can complement your offerings to increase value for customers — without overlapping services — while the collaboration grows all of the involved parties,” she adds. “Beyond the three main components, the fourth is data, which ultimately glues everything together. As witnessed at Alibaba, data has helped the group scale all of its business units quickly. “We can see that this will drive Southeast Asia’s e-commerce growth in the near future. The role of data scientists and analysts will be more important than ever,” she concludes.